2006 is the seventh season of racing for this rapidly growing series. Today there are over 250 Challenge cars on tracks and at races around the country. The Factory Five Racing-NASA Challenge Series is an amateur racing series based on a tightly spec’d Factory Five competition version of it’s famous roadster design. The series was launched in August 2000 and the inaugural race was held with eight cars at Virginia International Raceway in Danville, Virginia. Over 200 Challenge Series Racers have shipped since and the series includes four U.S. regions racing under the sanctioning body of the National Auto Sport Association (NASA). 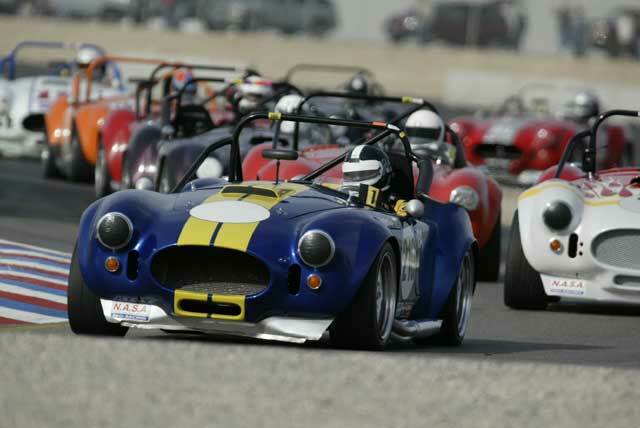 The legendary Bob Bondurant takes the pole at the exhibition race during the November 2003 Nationals Race in Las Vegas Nevada. Way back in 1999 the editor of Grassroots Motorsport magazine, Tim Suddard, test drove a Factory Five MkI roadster for the magazine. After having spent considerable time behind the wheel, Tim mentioned what a fun and exciting vintage style spec racer he felt the FFR design could become with some competition upgrades. One sunny day at Road Atlanta in October of 1999, Chris Cobetto, Director of then newly established Mid Atlantic Region of the National Auto Sport Association (NASA) stopped by the Grassroots Motorsports Magazine booth to catch up with Grassroots Motorsports Magazine owner Tim Suddard. The conversation turned to some of the new series that were growing within NASA and, somewhat seriously, Tim said to Chris, “Wouldn’t it be cool to see a field of 30 of these FFR Roadsters all battling it out?” Anyone that calls themselves a car lover could immediately appreciate Tim’s idea and Chris Cobetto wasted no time getting in touch with FFR owner Mark Smith who agreed to create a special Spec Racer Version of the very popular FFR Roadster. With some technical assistance from our own Jim Schkenk, Chris took on the challenge of drafting the first set of rules and boom, the Factory Five Challenge Series was born. With our existing MkI Roadster tube steel frame and chassis we envisioned a car that could provide that perfect combination of performance, safety, affordability and good looks. It looked straightforward enough and we embarked on the journey that has lasted now more than seven years. 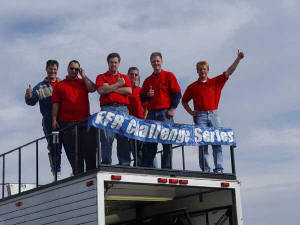 The result is the FFR Challenge Series and Challenge Series Racer. This car is an “every mans” race car, perfect as a week-end “open track” weapon while at the same time configured for wheel-to-wheel, one-design spec racing in the FFR-NASA Series. Let’s go back though to the design and development stage where the early goals and thinking laid the groundwork for the current success. We took the time to study every racing series out there and understand why so many have failed. Our team understood that many racing series begin with clear goals of providing grassroots level racing in an affordable and yet challenging and exciting format. Unfortunately, as has so often happened in the past, many of these programs grow to become tangled in rules, burdened with high costs and stifled by limited competitive driving opportunities. The success of the Challenge Series car is attributed almost completely to the strict adherence we have made to the founding goals that drive the series and car design. Another reason for the Challenge Series success has been the fact that the challenge car is more than a dedicated race car, it is capable of street use (according to individual state laws), putting it in a multi-use category few race cars share. 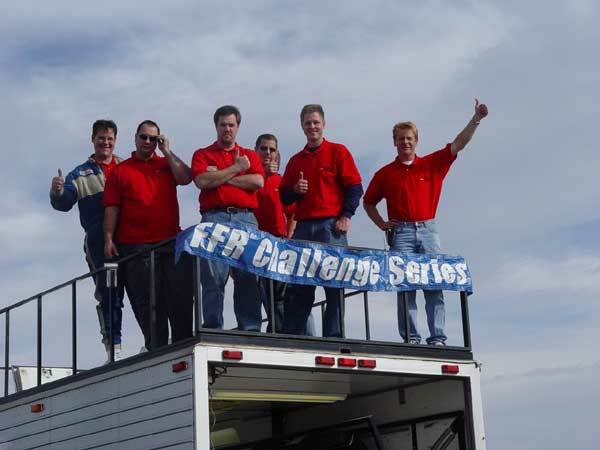 In the fall of 1999 we made the decision to give the FFR Challenge Series a go. We wrote out our goals for the car design and the series (these goals have remained unchanged to this day). In April of 2000 the first of 10 cars were shipping to the Mid-Atlantic region! By mid-summer, news of the program began to leak out. Car and Driver Magazine tested one of the early cars and published their results in the November 2000 issue. The first season on the East coast went well. The first race at VIR (Virginia International Raceway) saw a field of about eight cars going wheel-to-wheel. In less than two years the series had grown to add the West coast region. 2002 saw the first National Championship race. 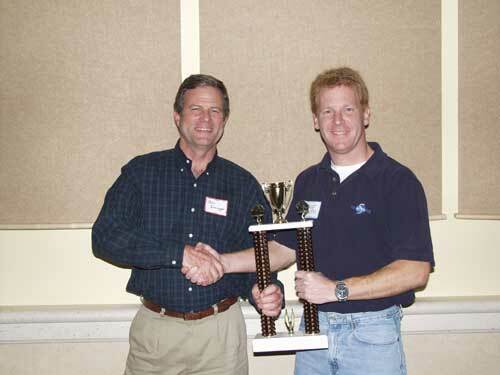 The 02 Nationals was the first time series racers from all over the country gathered to find out who’s fastest. 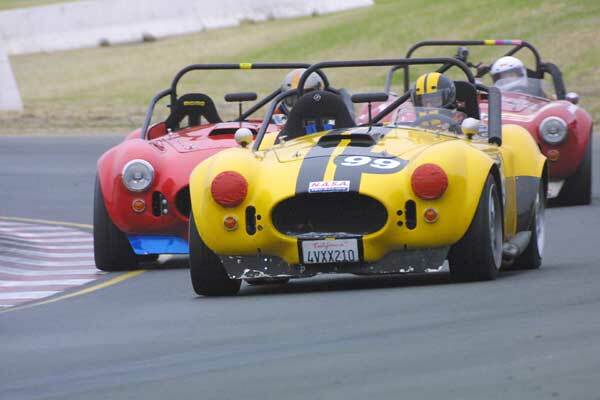 It was held at Infineon Raceway and you can read about it on this link or check out our free DVD which features an awesome 30 minute section on the event and race. 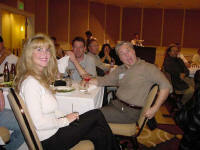 In 2003 we introduced three more Challenge Series regions (Texas, Ohio-Indiana, and North East). The North east region is still a test region since NASA lacks sufficient events in the region. NE Region racers compete in the east coast series until this region is expanded. 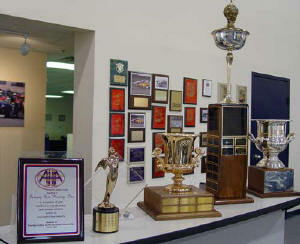 By 2004 we have built and shipped more than 200 Challenge Series cars and hosted three Nationals Championship Races. The 2005 Nationals were held Labor Day weekend at VIR. The company is supporting the series and plans to continue its support indefinitely. Left: Steve Sparklin leads Seabor & Elam thru the esses @ Infineon.2002. Middle: John Insinger wins “Best of Show” Right: Perrenial racers Bobbie & Dan Elam at FFROG-Fest West 2003. Early on we set the goals for the FFR team to support a national and regional level competitive program that can provide safe, reliable, affordable racing in an exciting wheel-to-wheel format. To keep our racing program on track today and over the years, we live by four big goals for everyone to see. They shape every decision that is made regarding the configuration, price, design and future of our spec car and the series. These goals surround us and keep us true to our mission. Safety: Safety of the drivers and competitors is the highest priority. 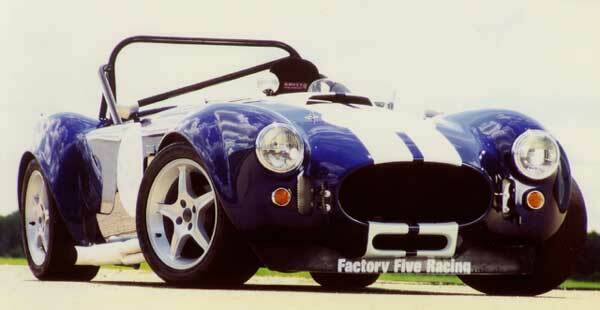 Affordable Racing: The average customer can build a Challenge Series car for a completed cost of about $20,000. Completed cars can be bought for between $22,000 and $35,000. The cars deliver excellent reliability and low seasonal maintenance. Excitement and Performance: The cars combine lightning acceleration, powerful brakes and high-end handling and the series provides an exciting, vintage racing experience. Rewards: The series is provides ways in which drivers and their teams can earn recognition without losing the pure amateur racing focus. The Challenge car design has had help from a lot of sources. The versatility of the design is the result of listening to a lot of people. This really has been a collaborative effort and thanks are owed to drivers, customers, industry writers, professionals and racing officials from NASA and SCCA. Not only has the car benefited greatly from the advice and help of some great racers, the series has benefited as well. As far as amateur racing series go, the FFR-NASA Challenge Series is one of the fastest growing series in the U.S. The drivers have shown long-term commitments to the series and the fellowship has been incredible! One of the best places for news about the series and to speak with other drivers is the FFR Challenge car forum found on the customer forum. Here you can speak with drivers, post questions about rules and cars, even find a customer in your area! Challenge car racing is about more than just performance. The fellowship of like-minded people, the excitement of racing with good friends, and the feeling you get from being part of an exclusive club of people who have built and/or race these specialty cars. Challenge series cars have racked up an impressive list of awards and race wins. The design has won the hearts of all those who have piloted it. 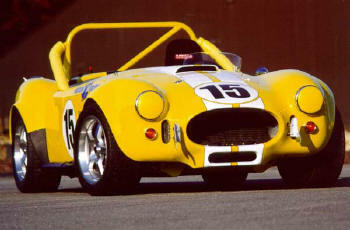 Check out the track record section of this site to compare how Challenge cars compare to other race cars.